At CDA, we only supply quality Solar Batteries from manufacturers with a strong Australian presence and an in-country technical support team. If anything goes wrong with your battery then we need to have it up and running as soon as possible. Batteries are designed to last more than 10 years, so a correctly designed system and quality battery will be far more economical in the long term. ​Solarwatt GmbH are a German global Solar Energy and Battery Charging giant who manufacture both batteries and modules in Germany. Solarwatts' MyReserve Lithium battery systems can be retrofitted to any existing Solar PV system, so no dedicated specific inverter is required. The MyReserve 500 is a compact case containing 2 x 2.2 kWh batteries (total 4.4 kWh) complete with charge controller and energy management system. The MyReserve 800 is an expansion of the MyReserve 500 and offers 8.8 kWh capacity. 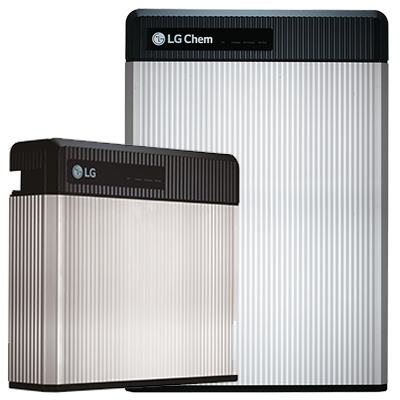 LG Chem are one of the leading global suppliers of Lithium batteries, their RESU High Voltage range are compatible with various new Hybrid inverters and offer a variety of battery sizes to suit demand. RESU High Voltage batteries can be installed inside or outside, either on a wall on directly onto the ground. RESU models range from the 4.3kW RESU6.5 to the 9.5kW RESU10. The Tesla Powerwall 2 is Teslas' latest home energy storage solution offering a storage capacity of 13.5 kWh and emergency back-up power The unit contains its own inverter so is compatible with existing systems and doesn't require you to change your existing inverter. Enphase are the leading US solar power and energy storage manufacturer who now offer a highly flexible battery storage solution that can be easily fitted to existing Enphase solar inverter systems, or be retrofitted via their gateway device to any existing Solar PV system. Their battery is fully modular so you add several straight away and then simply add additional batteries later if desired. Battery Capacity - 1.2 kWh, Weight - 25 kg, Warranty 10-years.